The ultimate chemistry kit. By performing 360 fascinating and fun experiments in a complete and well-balanced curriculum, you will learn first-hand every fundamental principle of this essential science, and more. 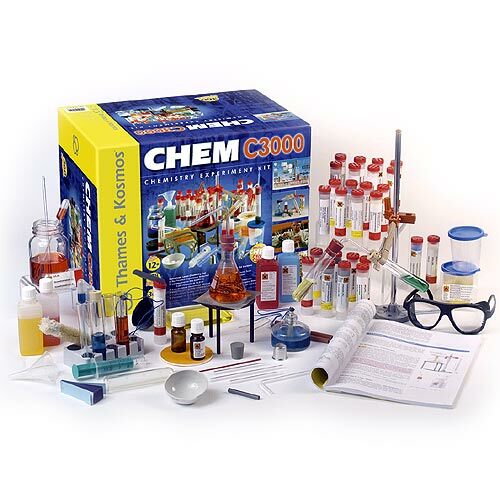 You will start with fun experiments to learn basic chemistry principles. Experiment with fuels and combustion. Make your own hydrochloric acid. Build a strong foundation in chemistry with exposure to a broad range of chemical phenomena and hands-on lab experience. As you gain experience with the tools and chemicals of the modern chem lab, you with also learn advanced topics such as chemical equations, atomic structures and the periodic table concepts that are critical to continued study of chemistry. Professional quality equipment and an easy-to-follow Experiment Manual help you make the most of your chemistry experiments.